For the last couple of weeks I have been down in Nosara, Costa Rica enjoying all that this peaceful town has to offer. From amazing beaches to endless activities, this place seems to have everything a surfer could ask for. The other day I was feeling a little adventurous, so I decided to ride my bike down to the town of Guiones to see what it had to offer. I had heard of a couple of surf schools and surf shops that were in the town and I was curious as to what kind of services and products they had available. Seeing that it’s the down season for tourism in Nosara and all of Costa Rica I wasn’t too surprised to see that almost all the surf shops in the area were closed for a couple months. 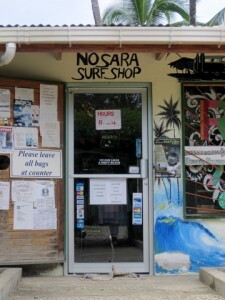 Instead I was a little surprised to see that the Nosara Surf Shop was up and going in full force. 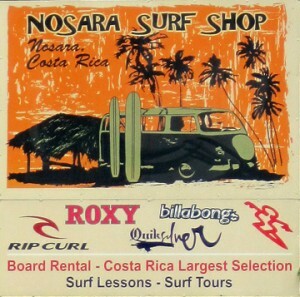 The Nosara Surf Shop is located on the main road that goes through the little town of Guiones. It has an amazing location considering the fact that it’s within walking distance to Playa Guiones (the main surfing beach) and that it’s right in the nestled between the main shops in town. Besides sitting in an ideal location I was also impressed with what it had to offer. 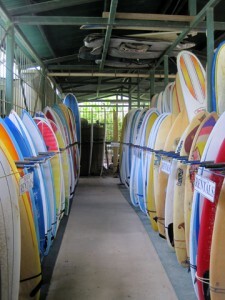 I figured it would probably have a handful of old yellow surfboards for rent and some local shirts or key chains. I was pleasantly surprised to find a very wide range of boards for rent and for sale with pretty decent prices (from $15-$25 a day). Besides the selection of surfboards they also have a full store that sells everything you ever need including big brands like Quiksilver, Billabong and O’Neil. Their prices are a little higher than in the states but at least they have what you need if you get in a pinch. For those of you looking to learn how to surf while in Costa Rica the Nosara Surf Shop also offers surf lessons to the public for about the same price as any other place around. On the other hand if you’re looking for a break from surfing you can also rent one of their quads for the day and explore what Nosara has to offer.